I think it’s about time I update you…. Exactly 15 days ago, it was a normal Wednesday morning. I was running, thinking about the Nike Women’s Marathon, high on life, and feeling strong. At about mile 4 (of my 8 mile planned run) I had what I would call a “tiny foot twinge“. To be safe, I decided to cut my run short and just run 5 miles. I saw a doctor right away and was informed that I was at high risk for a stress fracture. My running shoe was replaced with a boot and I would be lying if I said I wasn’t devastated by the thought of not being able to run the marathon that is now just a month away. The first several days I was in severe denial. Then I was just plain pissed the hell off. How did I not see this coming??? What happened??? Could I have prevented this injury??? Thousands of thoughts raced through my mind. Of course, I didn’t find the answer I was looking for, but I did find this great article titled How to Cope With the 5 Stages of Injury Grief. If you are currently struggling with an injury, I feel your pain (literally & figuratively ;-)) and for those of you who have had an injury in the past… thank you for being strong and reminding me that I will get through this. Four appointments, two X-rays, and one bone scan later, I was overjoyed to hear that I DO NOT have a stress fracture! Unfortunately, I have posterior tibial tendonitis. And, unfortunately, I am still in quite a bit of pain. 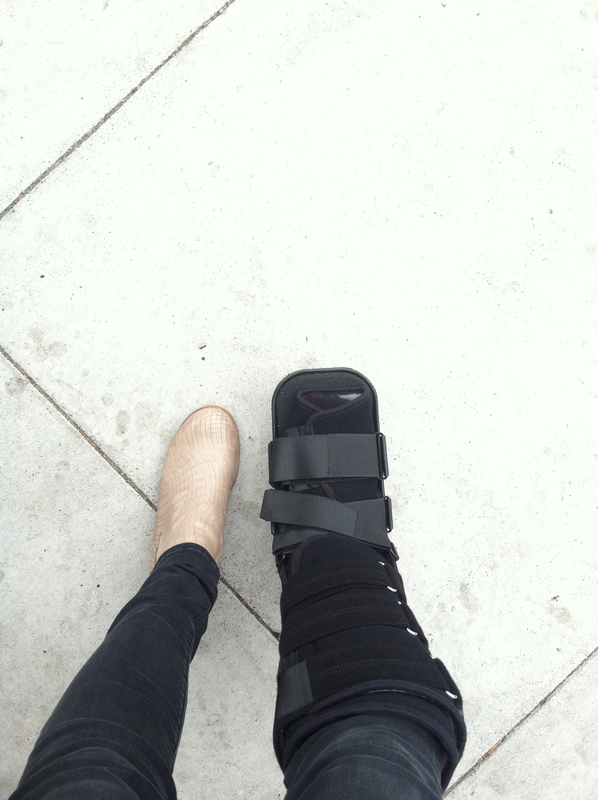 On the bright side, today I was able to finally take the boot off and try out a new pair of shoes with arch supports. It feels weird to have to “work up to” walking for more than 5 minutes at a time, when just a few weeks ago I was running my 19 miler and feeling stronger than ever. So, right now, I am taking it day by day. I am more grateful than ever for those closest to me, that have helped talk me through the recent ups and downs. Have you ever had a foot injury? Or any injury that prevented you from doing what you loved? How did you cope? Karen thank you so very much! This comment almost made me cry. I know that you understand exactly how I am feeling! I am so grateful for you 🙂 MISS & LOVE YOU TOO!! oh my gosh I’m so sorry! Hali, one of your grandmothers favorite sayings was: Everything happens for a reason – you just have to find out what the reason is. I love your blog, but I am not always sure about how to respond to it. Oh honey, I am so, so, SO sorry to hear this. You know I’ve been fighting with my own injury, and it is so discouraging. At the same time, it is humbling to be in so much pain that you can barely walk, let alone run (that’s where I was this weekend). I hope for a speedy recovery for you. Do you have any idea how long you might be out? I’m so glad you don’t have a stress fracture! Totally sounds like something that I would have Googled, too. Hang in there! !